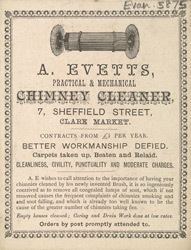 This is an advertisement for A. Evetts, chimney sweep. Fire was a hazard for the Victorians and so maintaining fireplaces and grates was an important job. The Lord Shaftesbury's Act in 1864 outlawed the use of children as chimney sweeps, so from this date on various cleaning methods and equipment were developed. Joseph Glass is generally recognised as the inventor of the system of canes and brushes advertised here, brushes being pushed up into the chimney from the fireplace below. There were over 1,000 chimney sweeps working in London in the late 19th century.